It’s been an absolutely insane week so far, and we are yet to even view our first event of the three-day extravaganza. The Ultimate Fighter 23 finale goes down on Thursday July 8 as the second straight event following tonight’s UFC Fight Night 90 card. Then we have the cherry on the cake, albeit depleted by Jon Jones’ failed drug test and removal from the main event, as UFC 200 goes down on Saturday July 9. In keeping with traditions, we have the TUF 23 finals weigh-in live stream going down at 6PM ET tonight, right here. 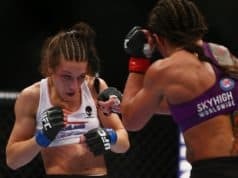 Headlining the card is a rematch between the season’s opposing coaches Joanna Jedrzejczyk and Claudia Gadelha. The world Muay Thai champion and current UFC women’s strawweight queen puts her belt on the line against the only contender to ever really trouble her in a fight. 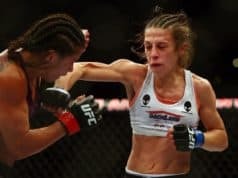 Many argued that the Brazilian ‘Claudinha’ actually won their first encounter, a fight that eventually went the way of Jedrzejczyk by a narrow margin. Also we’ll have the light-heavyweight competition final fight between Khalil Rountree and Andrew Sanchez in the co-main event, as well as Amanda Cooper vs. Tatiana Suarez in the TUF 23 Strawweight Final. 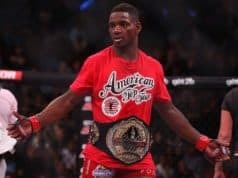 Former Bellator lightweight champion Will Brooks faces British boxer Ross Pearson, and the return of Gray Maynard highlights a ferocious looking card from Sin City. So join us right here at 4 PM ET for the live streaming TUF 23 finals weigh-in video, or check in right after for the updated results!